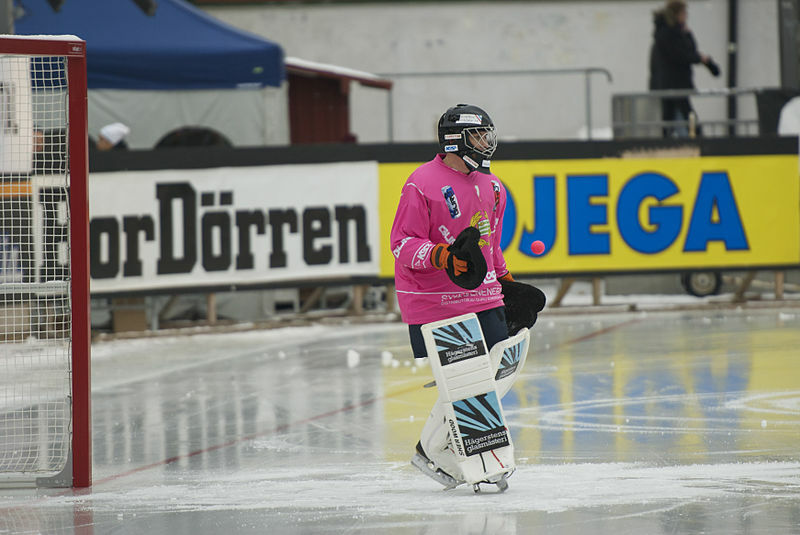 The sound of blades grinding the ice of players skating at high speeds, blistering 100+ mph slap shots, beautiful end to end rushes with tape to tape passes, and sprawling kick saves by goaltenders are major components of the great game of bandy. Bandy is an incredibly skilful and speedy game played on an extremely large ice rink primarily in northern Europe and Russia. To someone who knows little about hockey, bandy can easily be mistaken for it and is even known as hockey in some remote locales in Finland and Sweden. 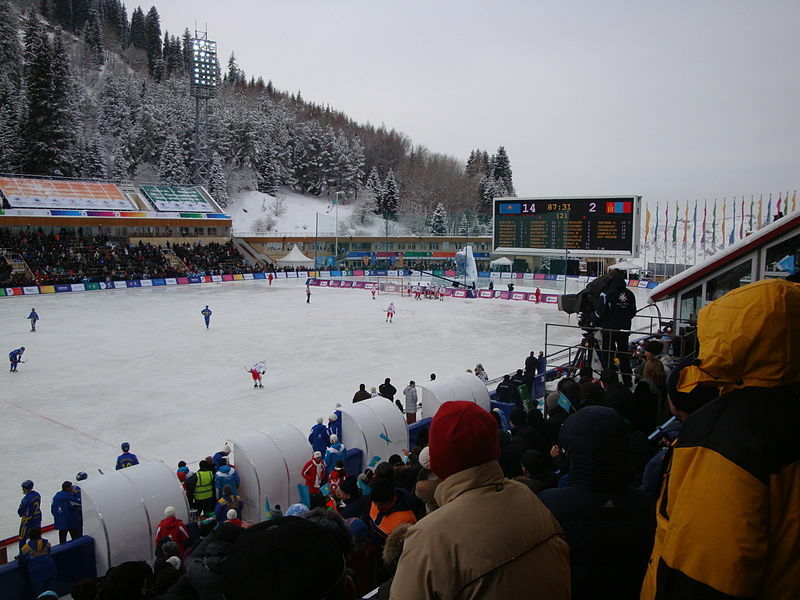 The game has also been coined “Russian Hockey” as early versions of the game were played in northern areas of Russia. It is often overlooked or never even heard of by many sports aficionados due to the more widely played game of Canadian ice hockey. Every hockey fan and player should check this game out at least once. My bucket list now includes playing a pickup game of bandy and watching a professional game live. Bandy and hockey share common historical ancestry. These two games diverged into two distinct sports throughout the 19th century with ice hockey developing in Canada and bandy formalizing in England. Late in the 19th century, English football was rapidly growing in popularity in Britain, with new clubs forming every year. A number of these clubs decided to start playing the casual winter sport of bandy to stay conditioned and have a little fun. As more teams began competing with each other, the need for universal rules became apparent. 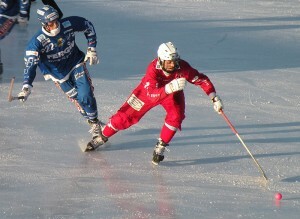 Since a majority of the bandy teams were primarily English football clubs, the formalized Bandy rules were heavily influenced by the rules of English football. 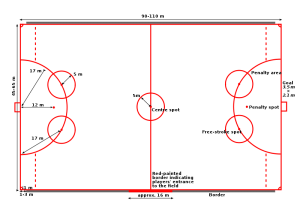 The size of the rink, also known as the pitch, is equivalent to the size of a soccer field which is approximately 350 feet long by about 180 feet wide. 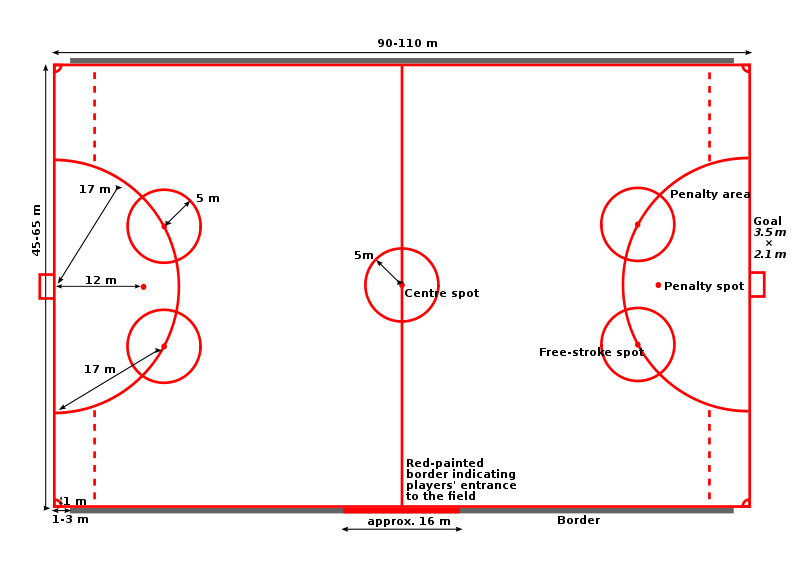 There are short boards that surround the rink, but they go beyond the out of bounds line, so the ball (they do not use a puck) can go out of bounds just like in soccer. The game time is 90 minutes long and is broken into 45-minute halves. Each team consists of 10 skaters and 1 goalie on the ice. The skaters include two fullbacks and a middle fullback who are defensemen near their own goal, two halfbacks and two quarterbacks who help transition the ball through the middle of the rink up to the three wingers who are the scorers for the team. Generally, there are three or four back up players on the bench, who unlike in soccer and similar to hockey, can substitute regularly throughout the game to give starting players rest. These skaters use bandy sticks, which are shorter than hockey sticks both in height and in length of the blade. The blade is flat as well. Since there are no blue lines, the offsides rule is this: you cannot skate behind the last opposing defender (not including the goalie) unless you are carrying the ball. If a pass is directed towards you, you must be either in front of or parallel to the last defensemen when the ball leaves the stick of your teammate in order to be onsides. This makes breakaways near impossible and puts greater emphasis on dangling around the opposition. This is the same offsides rule as soccer. One major difference to hockey is bandy’s emphasis on speed rather than physicality. Body checking and fighting are not allowed, with both being penalties. If that’s the sole reason why you like hockey, bandy is most likely not the sport for you. Players can make shoulder to shoulder contact when fighting for ball possession to push the opposition off the ball. Also, much to the dismay of New York Rangers coach John Tortorella, skaters are not allowed to drop to the ice to block shots. They can, however, similar to soccer, make a wall of defenders in front of the net during a “free stroke,” where the opposing forwards are given a free shot on goal due to some type of penalty. A “corner stroke” can be taken if the ball is deflected behind the goal line by a defender or goalkeeper. This again, is quite similar to soccer, where a forward shoots the ball from the corner of the rink to his teammates surrounding the circular penalty area, who will usually shoot a one-timer on goal for a scoring chance. This can be seen in the first highlight video at 1:30 below. Another significant difference to hockey is that the goalie does not use a stick, instead wearing two catching gloves to stop the ball being propelled to a net quite larger than hockey’s 6 foot by 4-foot goal. Bandy goalies must block shots from going into an 11 foot by 7-foot net. Similar to soccer, they are responsible for throwing the ball back in to play if they make a save or the opposing forwards shoot the ball out of bounds behind the goal line. The USA team is made up primarily of former college and professional hockey players. 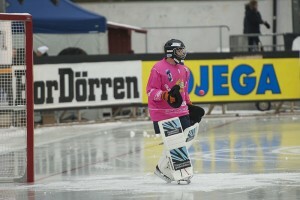 The following clip is a really cool amateur video of bandy being played at a public outdoor rink. Although you can’t really follow the play, this clip captures the purity of bandy for me, as there are no announcers talking or music blaring over the natural ambiance of the game. Watching their skating patterns and hearing the sounds of the skates on the ice in this quaint outdoor setting is breathtaking. Throughout the 20th century bandy was hampered from expanding partly due to the technological difficulties of sustaining an ice surface as large as a football field, and in large part due to the fast expansion of Canadian ice hockey into Europe during the first few decades of the century. Numerous European teams prepared for the 1920 Olympic hockey tournament by playing bandy, only to arrive seeing they needed to play under the Canadian ice hockey rules, which they had never seen before. This quickly converted a vast majority of bandy players into hockey players, not because ice hockey was necessarily better than bandy, but for the sole reason that hockey was the game they needed to play in order to compete in the Olympics. This relegated bandy into a much smaller northern niche sport. The bandy background of many of these early European hockey players is a significant influence on why even modern hockey in Europe is played on a larger ice surface and tends to be less physical. The Federation of International Bandy (FIB) and it’s members are pushing hard for their game to be included in the Winter Olympics. By placing this game on the international stage, it will make recruiting new youth players, some adult players, and others who are interested in contributing to the game in some way (refereeing, youth coaching etc) far easier. Far fewer children would play hockey without the allure of the National Hockey League and the Stanley Cup. 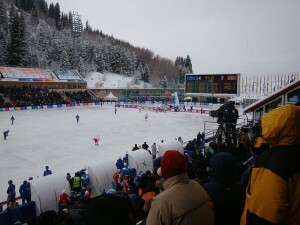 Creating the dream of an Olympic bandy gold medal could help draw increased awareness and possible interest in participating in the game. Although the FIB has 29 member nations, a vast majority are like the United States and Canada, which have very few players participating in the game and it remains relatively unknown to most of the people in their respective countries. I have no affiliation with these organizations, but since bandy seems like so much fun, I would encourage everyone to check out their websites and explore this exotic and beautiful game.